2 What is a coffee morning sickness? 3 How much caffeine is in various drinks (on 100 g)? Caffeine - an alkaloid, which is in the natural form found in the leaves, seeds or fruits of plants such as the coffee tree, tea bush, cocoa, guarana kola, yerba mate, from the leaves of which are mate drink, It is known to all 60 various plants and products of its contents. Caffeine produced from natural raw materials or synthetic method for the production of Power beverage, cola and pharmaceuticals. Caffeine acts somewhat milder tea, but longer, by gradually increasing, caffeine coffee acts more rapidly, quickly. The drug has been in 1819 It was first isolated from coffee German F. Runge, that is why caffeine has been named. after 8 years old, Professor Udry singled him out as the tea leaves, but, without knowing, it is also caffeine, He called it theine. only after 10 s was established complete identity of the tea and coffee alkaloids. 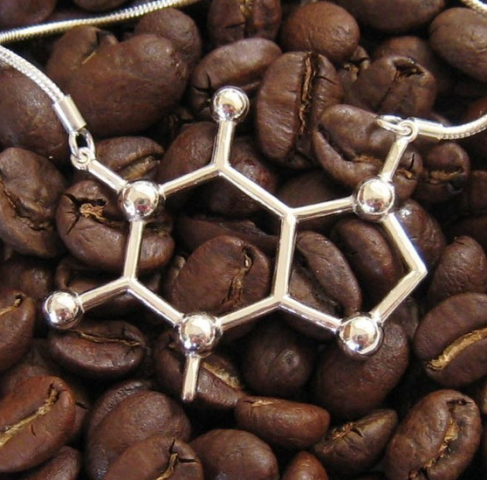 Synthetic caffeine was obtained at the end of 19 century scholar Fischer. First of all, caffeine has a stimulating effect on the nervous system, As a stimulant for the brain cortex. In moderate doses it has a positive effect on locomotor activity, muscle reflexes. Increasing mental and physical performance, fatigue and drowsiness, especially at the beginning of the day. Marked effect on the cardiovascular system, respiratory center, quickens the heartbeat and breathing, expand some basic vessels. In medicine is used to treat migraine, in case of poisoning, as a diuretic. The harm is manifested in the overexcited nervous system, insomnia, pressure increase and palpitation. Excessive consumption of drinks or drugs, caffeinated, It can lead to addiction, exhaustion, as if to drink in a short period of excessive amounts of caffeine, dose limiting for an organism which 10 g, death comes. What is a coffee morning sickness? As a result of excessive consumption of large amounts of caffeinated beverages, can begin the so-called coffee toxicosis. It manifests itself in dizziness, fever, overexcited, nausea, trembling of the limbs, anxiety, tachycardia. Comes this state, in some cases after 5 -6 cups of coffee, drunk in a row (0,5 g caffeine). If symptoms should immediately drink as much as possible fluids - pure water, to excessive caffeine was quickly withdrawn. That is why it is important to know the caffeine content in various drinks, to avoid its overdose in the body, avoiding side effects. How much caffeine is in various drinks (on 100 g)? In this way, largest caffeine content in some varieties of espresso and some energy drinks. The Robusta coffees more caffeine, than arabica. Learn the caffeine content on the packaging of products, do not let it over-consumption, and caffeine toxicosis will never threaten you.